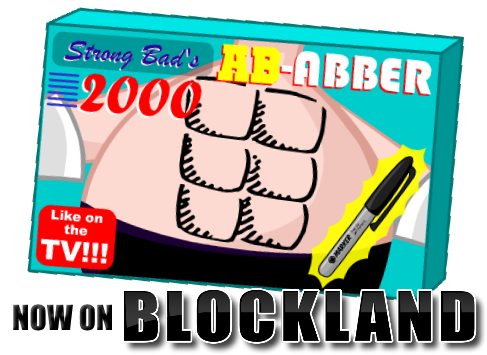 STRONG BAD'S AB-ABBER 2000, RIPPED DIRECTLY FROM SBEMAIL 77! It only takes a few seconds to get it on and presto, you're MACHO! And like putting it on, this download and installation only takes a few seconds! Enjoy your new abs! Show it off to everybody! Get everybody scared! Punch people! You name it! The possibilities with your new abs will be endless! Before you ask, yes, I was trying to mock those ads on TV. And yes, I fixed the alpha-color issues this time around.